When I first started maskmaking I numbered my masks sequentially. Some of them never made it to market (for instance #1 & 2). The very first steampunk item I made was a gas mask, and it carried number 43. I learned from everything I was making, and at some point I decided I wanted to update it and improve it. Every steampunk mask after #43 got a name, but to keep with tradition I named this version #66. I don't even remember how I came up with that number. It has two different eyepieces, one made from a camera lens and the other from an old flashlight. The respirator near the mouth was mostly scratch built, molded and cast in resin. The #43 was closely modeled after a WWII rubber gas mask I had found at a yard sale. 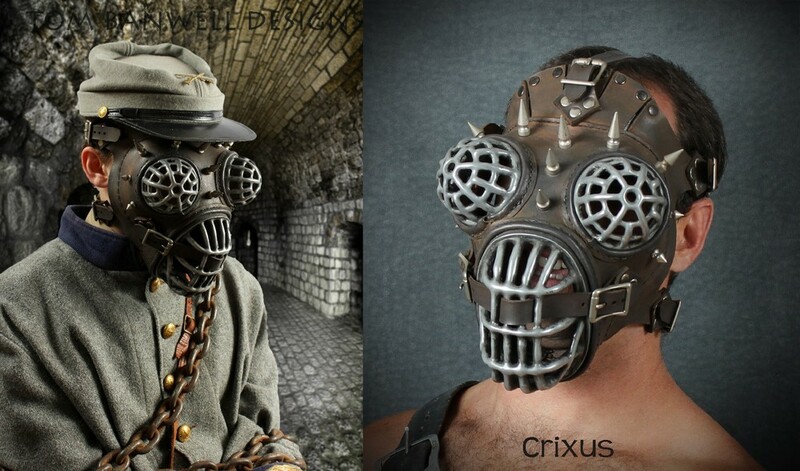 Here are other assorted masks that can be loosely described as steampunk. The Skull Respirator I felt could be improved so that it wasn't facing downward so much. It is still among my projects to complete. The Crocodile was made for a theatrical performance of Peter Pan. The Bat Masked Man was of course modeled after Batman, and my attempt to create a back story character. And Falconer was an expanded version of our popular Eyecage mask, both of which we still sell. In 2009 I made a bunch of steampunk gas masks and respirators for the indy film "After the Fall". Here is a photo of them.